This Is Our Home, It Is Not For Sale, is a documentary film by Jon Schwartz: an archetypal American neighborhood, Riverside in Houston, Texas, which experienced the classic syndrome of integration, real estate blockbusting, white flight, and regentrification common to virtually every American city. 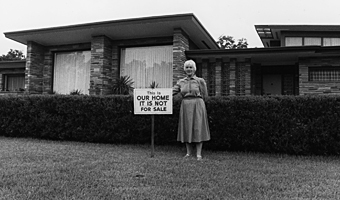 This Is Our Home, It Is Not For Sale is the 60-year history of an archetypal American neighborhood, Riverside in Houston, Texas, which experienced the classic syndrome of integration, real estate blockbusting, white flight, and regentrification common to virtually every American city. The film's title comes from that era of racial transition when whites, pressed by real estate agents to sell to blacks, prominently displayed signs proclaiming: "This Is Our Home, It Is Not For Sale"--words that would be swallowed in almost every case as white owners stampeded and property values collapsed. Years later, that dictum remained just as timely and relevant to Riverside's affluent black community as they continued to protest various social and institutional encroachments into the area. For thirty years, Riverside was the cultural center of Houston's Jewish community, who came to settle here upon being barred from other elite areas of the city by the existing "gentlemen's agreements." A viable community, Riverside seemed to have a stable future as a residence where white upper and middle class families--both Jewish and gentile--lived harmoniously together. But a series of unforeseen factors brought unexpected change. This change was heralded by four sticks of dynamite which rocked the home of the Jack Caesar family, the first black family to break the color barrier and move into Riverside. This well-publicized bombing plus wide-spread blockbusting by real estate agents accelerated the racial transition. Middle and upper class blacks replaced fleeing whites into the area. As such, Riverside emerged as one of the leading minority communities in the U.S. For upwardly mobile blacks who had found the good life here, their status quo was threatened by: 1) the expansion of two universities into the area; 2) the construction of a freeway displacing the western edge of the neighborhood; 3) the placement of a county psychiatric hospital within the neighborhood; and 4) the reappearance of white home buyers into the area. The poignance of the re-enactment of resident responses, despite role reversals and a changing cast of characters, serves to evoke a deeper appreciation of the meanings and values we attach to home and neighborhood and of the forces that threaten those values. That a neighborhood with a sense of community faced crises, changed, and yet retained the same view the very nature of people, who, despite their differences, share many of the same hopes and aspirations. Brimming with history, replete with social and political issues, the Riverside story is above all a human document. For Riverside is a neighborhood that speaks not just of history and issues, but of the intangible rhythms, spirit, and dreams of the people who have lived there. Home video purchasers may use the videos in non-theatrical situations only. Home video DVDs are purchased for home use only and may not be used in class, circulated in an insti- tutional library, or be exhibited to the general public. All home video orders must be paid by check or money order in advance of shipment. Price for home video DVD is $60 postpaid. Includes universities, colleges, corporations, government agencies, high schools, libraries, and community organizations. Purchases include public performance rights where no admission is charged. Purchases must be sent to an institutional address and ordered on an institutional letterhead. Price for educational or institutional entity is $195.00 postpaid. Purchase orders are accepted from colleges, universities, museums, government agencies, corporations, high schools, and public libraries only. All other individuals and organizations must prepay by check or money order. Purchase orders must specify the address and telephone number of the accounts payable department and the name of the person authorizing the purchase. Public performance rights are included with an institutional purchase; A license for closed-circuit use within a single campus is included with an institutional purchase; Purchase does not include nor imply the right to duplicate, recast, edit, abridge, or transform the video or DVD by analog or digital means or any other fashion whatsoever; Purchase does not include nor imply the right to transmit videos by analog or digital means by broadcast, open-cable, direct broad- cast satellite, internet, or other means nor to any off-campus or distance learning site. Checks or money orders for home video purchase are to be made payable in advance. For all institutional or educational purchases, terms are net 30 days from shipping date. All checks should be made payable to: Jon Schwartz. All orders should be mailed to Jon Schwartz, 955 2nd Street, #4, Santa Monica, CA 90403-2447. All purchases are shipped insured at the expense of the purchaser. Any damaged or defective video or DVD will be replaced at no charge for up to one month from shipping date. A Riverside production. Produced and directed by Jon Schwartz. Camera (color), Levie Isaacks; editor, Ronald Medico; sound, Brenda Reiswerg. (No MPAA Rating.) Running time: 190 mins. If the purpose of a documentary film is to document an event or situation, then Jon Schwartz has a winner with his very long but scrupulously crafted "This Is Our Home, It Is Not For Sale." The entertainment value of a 3-hour plus documentary on a Houston neighborhood cannot be understated, but Schwartz has come up with a film that is compelling, challenging, thorough and watchable. The title comes from the signs posted in Houston's Riverside neighborhood during the era of blockbusting, signaling solidarity among residents to hold on to their beautiful neighborhood. River- side has been a neighborhood of almost ceaseless transition and the onslaught of changes has caused virtually the same drama to be reenacted among new configurations of Riverside residents. In the 1920s, Riverside was an alternative residential district to Houston's swanky River Oaks whose "social restrictions" effectively blocked sales to Jews. While Riverside was never an exclusively Jewish neighborhood, it became known as the Jewish River Oaks and housed some of the city's most prominent residents in huge, distinctive homes on palatial grounds. By the 1960s, blacks were buying into Riverside and a tide of white flight ensued. By the 1970s, Riverside was uneasily integrated. Today, the drama continues as white gays are purchasing houses, causing yet another wave of transition, prejudice and fear. Schwartz traces the history of Riverside chronologically, using an interview technique which bars the viewer from ever seeing the inter- viewer or hearing his questions. The editing of these interviews is superlative, and the pace of the long film never flags. However, there is only one instance when Schwartz gives us the name or title of his interview subject, so the viewer is left mainly watching unknown people recall their old neighborhood. There is no voice-over and no overt attempt to manipulate the viewer's opinions. Schwartz juxtaposes the interviews carefully, so they build on each other and consolidate the story. In a few cases, respondents contradict each other, even resorting to name- calling. One of the best portions involves interviews with the first black residents to integrate Riverside. Although much of the bitterness from those years has dissipated, the interviewees speak with firm memories about the bombing of one black's home or the sit-in at a local lunch counter. Schwartz has interspersed his interview segments with home movies, historical footage, old photographs, and some new footage of contemporary life in the neighborhood, underlaid with some wonderful jazz music from the local Arnett Cobb Quintet. What happens after aboriginal land has become backyard "property"? Texas director Jon Schwartz's thrilling masterpiece of social history, "This Is Our Home, It Is Not For Sale, offers an array of answers. On paper, "This Is Our Home..." (the title refers to signs that were erected by black and white residents being pressed to sell their suburban Houston homes by unscrupulous, racist-baiting realtors) sounds daunting: it is three hours long and features a cast of 105 people talking about their houses in a small suburb divided by a bayou. But it is as compelling (if not as complex) as "Hotel Terminus: The Life and Times of Klaus Barbie." Back when the neighborhood, Riverside, was founded in the twenties, alligators and garfish abounded in the bayou, but "the people moving in were up-and coming." Predominantly Jewish, they prospered and reared their families in peace--keys were left in the ignitions of cars parked in the driveways; crime was unknown. "It fit my definition of what a neighborhood should be," a man nostaligically remembers. (The nostalgia is underlined by fabulously revealing middle-class home movies of the fifties.) "We knew where the bad dogs were and the mean people were." The IQ level at the local elementary school was judged among the highest in Houston. 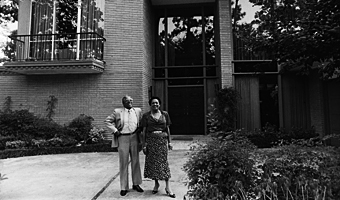 In 1952, a black family, the Caesars, moved in. "There was a rumor going around that they were funded by the NAACP to purchase the house," a white woman laughs. Now. But even then, when the Caesar home was bombed, most of the whites were sympathetic, if not exactly certain they would stay around to express those sympathies. Says one of them: "Most of us said we would not be the first to sell our homes to blacks. But we might be the second." The whites, in the words of a black resident, began "tipping out" and blacks began "tipping in." Meanwhile, realtors taking advantage of the panic purchased homes and divided them into apartments; crime came to the neighborhood. As the civil-rights movement burgeoned, one of the residents saw his own grocery store, Weingartens, become the target of demonstrations by his own neighbors. Weingarten was a member of the humanitarian B'nai B'rith, but his store was nonetheless segregated, and although 70 per cent of the clientele was "colored," blacks were forbidden to use the restrooms or the lunch counters. "There certainly was a moral issue, to stand up and recognize that you're part of a white flight," says one Jew, uncomfortably reviewing his role in the period. "Generally speaking," adds another, we were more liberal with our ballots than we were with our personal relations with blacks." Today, the tables have turned and gentrification is proceeding apace in Riverside as whites (some of them gay) move back into the remaining mansions to the consternation (sometimes racist) of the blacks. "No one here is color blind," declares one of the newest white residents, "the blacks or the whites." An elderly, wealthy, well-spoken and altogether elegant black woman is talking about the years her husband has devoted to "doing the yard" in front of their home. One day, a white man drove by and asked how much her husband was paid to do such a good job--the white man was looking for a yardboy. "I'm well paid," the husband replied. "I get to sleep with the landlady." The old wife looks into the camera and smiles. "And that is his payment for doing the yard."